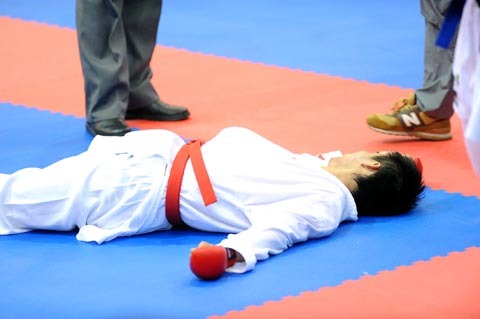 Taiwan’s Huang Hao-yun lies knocked out on the mat after winning the karate gold at the Kaohsiung World Games yesterday. Taiwan got back on the medal trail yesterday in dramatic fashion on the penultimate day of action with three gold medals at the World Games in Kaohsiung. The golds came in karate (one) and powerlifting (two), while Taiwanese athletes also picked up one bronze each in Karate and women’s nine ball pool. The Taipei District Court yesterday set Sept. 11 as the date it will announce its verdict in the corruption cases against former president Chen Shui-bian. The former president has maintained that the money he sent overseas was from leftover campaign funds that he dedicated to classified foreign relations building, while denying that the money was earned through illegal dealings. Former president Chen Shui-bian yesterday again refused to answer questions at his trial at Taipei District Court. Presiding Judge Tsai Shou-hsun scheduled yesterday’s session to have Chen examine case files. All of Tsai’s questions to the former president regarding whether he had any comments about the files went unanswered. The Mainland Affairs Council (MAC) said yesterday it was considering relaxing regulations to allow Chinese media outlets to establish branches in Taipei and vice versa. Currently, only individual Chinese reporters, not media organizations, are allowed to enter Taiwan on three-month visas. The same rule applies to Taiwanese journalists in China. 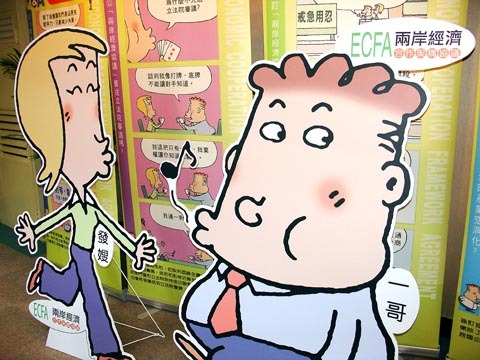 Cartoon characters Fa Sao, left, and Yi-ge are seen in Taipei on Monday standing in front of comic strips designed to inform the public about the contents of the proposed economic cooperation framework agreement (ECFA) between Taiwan and China. A comic strip published by the Ministry of Economic Affairs (MOEA) to promote a proposed economic cooperation framework agreement (ECFA) with China is marred by racist, derogatory and “extremely offensive” content, the Democratic Progressive Party (DPP) said yesterday. 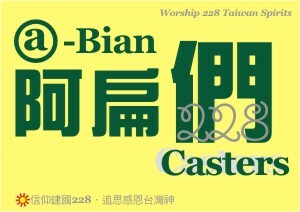 The party threatened to report the ministry to the Control Yuan unless it suspended the comic strip within three days. Former president Chen Shui-bian’s secretary said yesterday that Chen had taken off the cast on his right foot, but was still hobbling when he walks. Chiang Chih-ming said the former president no longer needed the cast for tendonitis in the foot, and did not need a wheelchair. 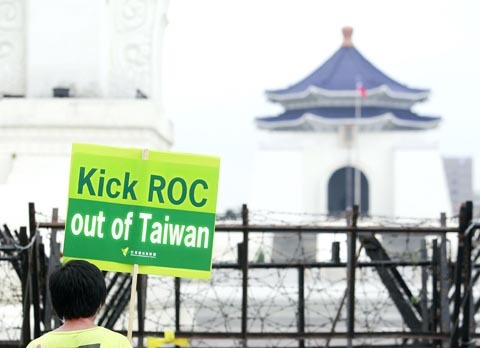 The Chinese Nationalist Party (KMT) government yesterday restored dictator Chiang Kai-shek’s name to National Taiwan Democracy Memorial Hall in Taipei, reversing a move two years ago by the then-­Democratic Progressive Party (DPP) administration to remove relics of authoritarianism. 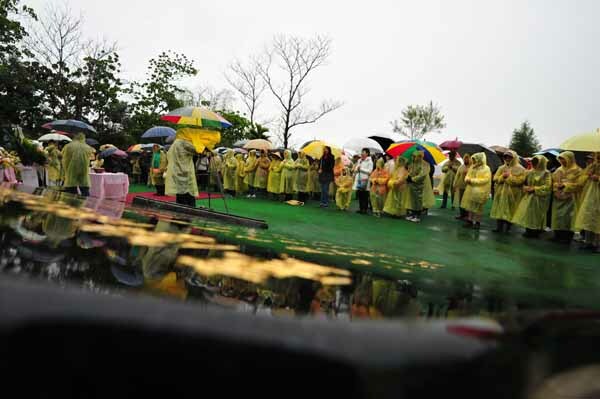 The Red Cross Society of the Republic of China (ROC), which has raised nearly NT$1.7 billion (US$58.5 million) for disaster victims in Japan, more than all other Taiwanese charities combined, is facing criticism that most of the money has yet to leave Taiwan. The complaints that only about a quarter of the money earmarked for Japan had been given to charitable aid efforts by yesterday came as attention focused on how the organization is managing the fund and how it plans to allocate the money.